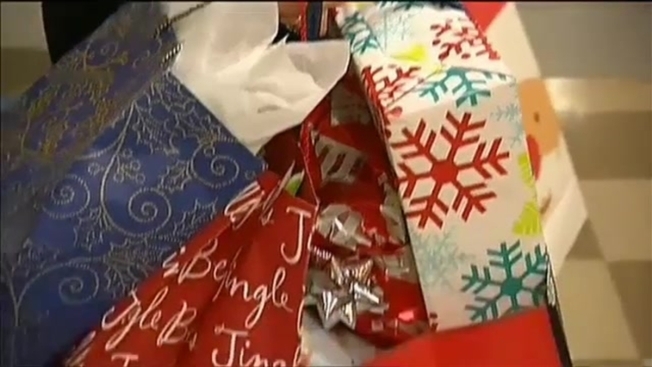 Manchester Boys and Girls Club gets sponsors to "adopt" a family in need, take on their wish lists, and buy the gifts. In the midst of a heroin epidemic in the city of Manchester, New Hampshire, poverty rates are rising and more families are finding it nearly impossible to buy Christmas gifts for their kids. With the help of the Boys and Girls Club of Manchester and community sponsors, 31 families are getting a helping hand. It's not Santa's sleigh, but for one Manchester mom, a cart full of gifts is just as magical. "This means they get Christmas this year," said mother of four, Abby. We're not showing Abby's face or using her last name because we don't want to identify her four children. She tells us she was out of work for the first half of the year, living solely on her husband's income. She just got a job and after paying for daycare Christmas gifts were going to be few and far between... until Tuesday. "They don't understand Santa comes to one person's house and not another, so we don't have to explain that this year," Abby said. Her eight-year-old son is a member at the Manchester Boys and Girls club, that's where she picked up the donated presents. Thirty-one other families did the same. "We see a lot of tears, I get a lot of hugs, it's a great time of year," said Boys and Girls Club Services Director Stephanie Noel. The Club serves up to 600 kids a day and more than 70 percent of those kids are living at or below the poverty level. Club leaders say the need for help during the holidays is greater ever year. "We do the best that we can to help these families, but without the support of community members, we can only go so far," Noel said. Dozens of community sponsors, like Amoskeag Beverages, come through, sometimes with truck-loads of gifts. "We get that huge volume of outpouring, our employees come and ask 'when is the tree going up, what can I do,'" said Terry Callahan with Amoskeag Beverages. The more than 200 employees filled the wish lists written by Abby's kids and made Abby's own holiday wishes come true. "We're so thankful," Abby said Tuesday. "Now, I know they are going to have a great Christmas." If you want to take on a family's wish list next year and support the Manchester community, reach out to the Boys and Girls Club of Manchester as early as October.